A guy is driving his pick-up truck through a small town, and he's got a panda in the front seat with him. The guy spots a police officer, pulls over, and tells the officer he found a panda just walking along the road. Now the guy is wondering what to do with the panda. The police officer says, "Well, take it to the zoo, I guess." The following week, the same policeman sees the same man with the panda again in the front seat. Both are wearing baseball caps. The policeman pulls him over and says, "I thought you were going to take that panda to the zoo?" The man replied, "I did...and we had such a good time at the zoo that I took him to a baseball game." As a big fan of corny dad jokes (I have four young boys), I love that you started this joke corner. A Panda bear walks into a restaurant. He orders a meal and eats it. After politely paying for his meal, he pulls out a gun and shoots it in the air. He immediately walks out the door. "Why did you do that?" hollered the confused waitress. Looking back over his shoulder the panda says "I'm a panda". "Look it up in the dictionary." The waitress locates the dictionary on her bosses desk and searches for the definition of panda bear. Finding it, she reads, "Panda Bear - A large black and white bear like mammal native to the far east. Eats shoots and leaves." We have that book over in documentation, if you ever need it. As a punctuation nerd and obsessive user of the Oxford comma, I love that book! Took me a minute, but I got it lol. A man in a movie theater notices what looks like a panda sitting next to him. "Are you a panda?" asked the man, surprised. The panda replied, "Well, I liked the book." Silly panda, if you like the book you'll probably hate the movie! What one feels like leaving InstructureCon. This is a classic - not a joke, but it still makes me giggle every time! Best Thread going in the Community!!!! Ok, one more to close out the week! Last one. Promise! Happy Friday Everyone! "You look like you're wearing a tuxedo"
Q: Why do pandas like old movies? A: Because they're in black and white. Q: What do Panda's eat for breakfast? A: Panda-cakes! Q: Did you hear about the party at the Chinese zoo? 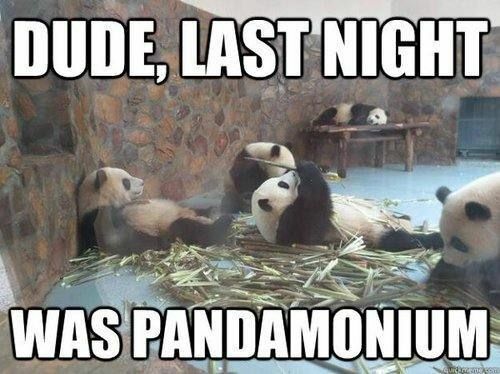 A: It was Panda-monium. Q: What do Pandas wear around their face when they're robbing banks? A: Pandana! Q: How did the panda lose his dinner? A: He was "Bamboozled"! Panda: "Hi Hungry, I'm Panda." Me: "Panda, I'm Quite Serious." Panda: "I thought said you were Hungry? I'm Panda"
Panda: "No, I'm Panda. How many times must I tell you?" What do you call a Bear with no ears? A B'ah.